Over/Under: Over 153.5 at 1.90 Bet Now! This is a game between two sides that hold a 2-1 record and both sides will think that they have a chance of winning this game. 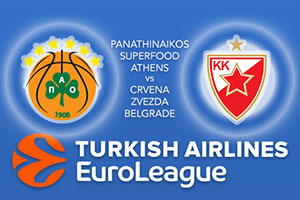 This is exactly the sort of basketball game that people associate with Euroleague but there is no need to look back on the history of these two sides, there is more than enough to look forward to with this Friday night clash. Panathinaikos will always fancy themselves at home but they also have some excellent players who are likely to give them a great chance of success. With KC Rivers and Nick Calathes both on an average of 12 points per game, you can expect these players to be at the heart of the home team’s thrusts on Friday evening. Chris Singleton has also provided an average of 10 points per game, so there are a few players that can impact on this match for the Greeks. The Belgrade basketball community received a boost with the news that the city will host the 2018 Euroleague Final Four. This definitely lifted the spirits of the side but there is no need to think that far in the future because the Belgrade side will be looking to book a trip to the 2017 Final Four1 A win in this game, to follow up their Round 3 triumph, would be very handy in that regard but of course, this may be easier said than done. One thing the Belgrade side has in their favour is a strong defensive record and at this stage of the campaign, they hold the best defence in the league as they have only offered up an average of 73.6 points so far. If they can maintain that record on Friday, they’ll have a fantastic chance of success. While the hosts will be favourites, the strong defensive work of the away team means this game may be a close affair. Look to take Crvena Zvezda mts Belgrade at +7.5, which is provided at odds of 1.90. With the Over/Under market, look to go OVER 153.5 which you can find available at odds of 1.90. Bet Now!